The 683 is the top model in B&W's most recent incarnation of the entry-level 600 Series. It's not a speaker range to be taken lightly, especially given that B&W is one of the largest dedicated loudspeaker makers in the world and thus one of the biggest players in the audiophile market. The new 600 Series is smaller than previously, and there are just two standmounts, the 686 and 685, and two floorstanding stereo models, the 684 and 683. There are also three subwoofers: ASW 608, 610 and 610XP (the '8' and '10' refer to the driver size in inches, and XP essentially just means bigger and better). There are also two centre speakers and a surround speaker. While the standmounts are very similar, except for the size of main driver and box, the two floorstanders are distinctly different. The 684 (£699) is a two-and-a-half-way with two matching Kevlar cones (one dedicated to bass, the other to bass and mid), while the more expensive and taller 683 takes an FST midrange unit from the 800 series and augments it with two new bass drivers. All the 600 series models have the same aluminium tweeter set in its distinctively offset face plate. The FST midrange driver makes the 683 the most interesting speaker in the new range. This is the same midrange technology that you will see on all of the three-way 800 Series models, including the mighty 800D. And given that the least expensive of those - the 804S - costs £2,700 and yet has a similar driver array, this newcomer would seem to be a bargain. Okay, it doesn't have the fancy 800 Series cabinet work, nor the Matrix internal bracing, and its tweeter is not on top in a separate enclosure. However, there is a Nautilus tube behind the 683's tweeter and the bass drivers look even more 'bling' thanks to their metal cones. The aluminium dome tweeter has been heavily revised for this series, its neodymium magnet giving it increased sensitivity while copper plating of the pole-piece extends the frequency response. Meanwhile, mass has been lowered thanks to an edge-wound voice coil, and the resonant frequency of the system has been reduced with a new surround material. The FST midrange is distinguished by its very thin foam surround, which is a termination rather than a suspension as such (FST stands for Fixed Suspension Transducer). The driver can work this way because it is limited to the midband and does not have a great deal of travel. B&W says that to bring the price of this drive unit down to the point where it could be used in the 600 it just simplifed the mounting method to a conventional bolt-on approach, rather than the suspended, single point fixing used in the 800 Series. There is also another major factor that we will return to. The bass drivers here are aluminium cones with a paper/Kevlar skin on the back - the combination giving stiffness and damping and ending up with the same mass as the carbon fibre/Rohacell-sandwich cones on the 804S. The 683 is a lot of loudspeaker for the money, its weighs in at 28kg and looks great in its Wengé vinyl skin, rubberised front panel and high quality bi-wire terminals. You may even wonder how it can be produced for the price? The answer is that B&W set up its own facility in China, moving the old 600 production line from its Worthing factory. This is the first range that the company has built overseas in its own facility and helps to explain how it can offer so much value for money. But as we know, there's more to the dark art of speaker building. The results are pretty damn impressive, if perhaps a little darker or more subdued than one might expect of a 600 Series speaker. Having run them in for 24 hours things did change - the balance becoming more lively and up-front. They did this to the extent that we went from an on-axis set-up with the speakers pointed at the listening chair to a straight down the room, parallel axis arrangement. Something to bear in mind should you be auditioning a brand new pair. We would be very impressed if any other companies could compete with the bandwidth and resolution on offer from the 683, which is a remarkably revealing speaker for its price. You can clearly hear right into the mix, the fine details that are often masked being easily picked out. This applied equally to differences between voices in a choir and to the little extras that accompany the vocal in a densely mixed piece of hip-hop. This is partly because of the speaker's wide dynamic range, its sensitivity to the smallest notes even when there are far louder ones threatening to hide them. It also comes down to excellent separation of instruments and voices, it's easy to pick out the little bits because there seems to be more space between them and the centre of the musical action. The 683's bass extension and power adds genuine gravitas to piano and orchestra, and for that matter the less cultivated productions of Dr Dre, Tool and Mr Oizo where the floor literally starts to resonate at specific frequencies. Something that one does not really expect of speakers at this price, especially ones that also deliver tunefulness and control at low frequencies. Helge Sunde's brass extravaganza positively bounces with zip in the B&W's hands, with the instruments taking a solid physical form in the room. We found little to criticise in this speaker given its price. It inevitably doesn't have the slam of something like an 804S, nor does it deliver the depth of image of more expensive designs. But when it comes to sheer resolution and lack of colouration from a speaker that also does proper bass, it is in a class of its own. 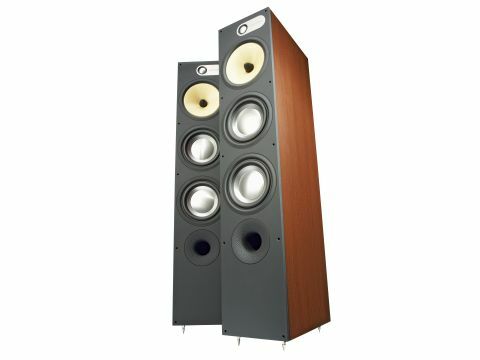 By getting its FST driver into a sub-£1,000 speaker B&W has without doubt raised the stakes for the market as a whole. You may be able to get real veneers on smaller speakers but you will struggle to find the combination of resolution, timing and energy in this competitive sector.